You have an Active Directory server with users and groups. You would like those to be synchronized with something else, be it a sql database, an openldap server, a text file, a samba passdb file, etc. Roles installed on your AD Server: Identity Management for Unix (including password synchronization and administration tools). A script to fetch the users and the groups from AD using the LDAP protocol. A script that will act as an SSO daemon to be able to synchronize passwords as well. (see http://support.microsoft.com/kb/324542 for more information on the subject). With this, you won't be able to extract the passwords currently stored in the AD server, but you will be notified of any change. pSSOd is a collection of perl scripts that provide the synchronization we want. You can find the scripts on github at: https://github.com/ZeWaren/pSSOd. 192.168.42.10: Windows Server 2008 R2. Add an UNIX computer and configure its properties. 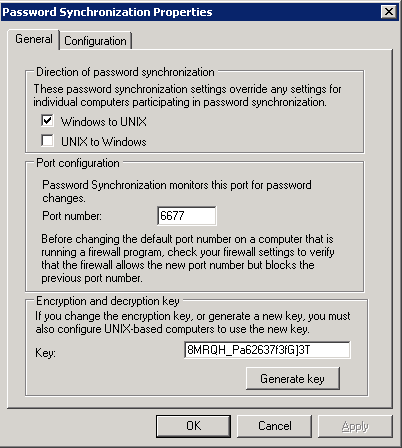 Configure and run perlsync.pl to fetch everything you need except the passwords. 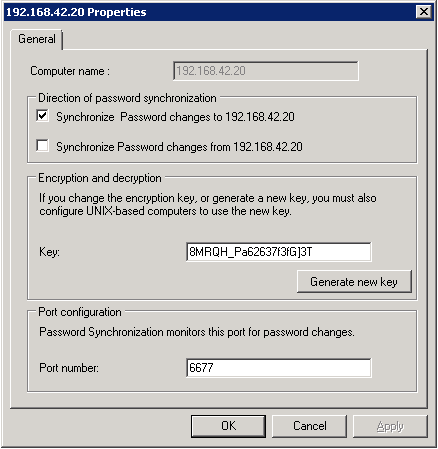 Configure and start perlssod.pl in order to be notified of any password change. Be sure to allow TCP connections between the two hosts, on port 6677. Watch /var/log/pssod.log to know what is happening. 2012/09/11 15:52:59 INFO Starting pSSOd. 2012/09/11 15:53:19 INFO Calling callback with user ufour. 2012/09/11 15:53:19 INFO Inside callback with user ufour and password abcd1234$!!. If everything works correctly, you now have a way to fetch the users and groups from the AD server, and a way to be notified of any password change. You can now complete perlssod.pl and perlsync.pl to store the information where you need it. Also, you can obviously build you own scripts depending on your needs.